Hard-working Scots tenor saxophonist Tommy Smith marks the 50th anniversary of the death of John Coltrane (and his own 50th birthday) with this cracking acoustic quartet collection of Trane tunes and originals. Smith is such a central part of the European jazz scene, pouring out gigs and recordings with the Scottish National Jazz Orchestra, Tommy Smith Youth Jazz Orchestra, Norwegian bassist Arild Andersen’s trio and the BBC Scottish Symphony Orchestra amongst others, that it’s hard to believe that this is his first acoustic quartet album since 2005. The recording has a ‘back to basics’ feel, but who needs more when the basics are so beautifully polished and presented? 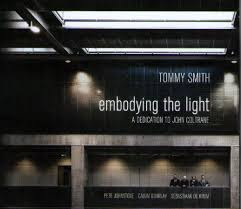 Smith really is a modern master of the tenor sax, he and his colleagues jump at the chance to get their teeth into John Coltrane’s repertoire, style and sound. Smith has composed three tunes for the album, all very much in the Coltrane zone. The opening Transformation starts with an open sweeping section allowing Smith’s tenor tone to sing out, before leaping into a up-tempo modal workout in the Impressions mould. Sebastiaan de Krom’s drumming is a key element here and throughout the album, sustaining power and variety in the ‘Elvin Jones’ mode without ever threatening to take over. The tracks are long enough (most around 9-11 minutes) to allow the musicians to get into their stride and develop ideas without overstaying their welcome. Smith has made a canny choice in bringing Glasgow-based pianist Pete Johnstone into the band. A relative newcomer at 27, Johnstone’s style is to build his solos by stretching, building and expanding on ideas and phrases, pursuing them to (and even beyond) their logical conclusion. He has a way of fearlessly following his nose into the maelstrom, giving shape and focus to his solos without ever resorting to simply running the changes – a musician to watch closely in future. Double bassist Callum Gourlay, a regular Smith collaborator, provides excellent support; his solo on Smith’s bouncing 12 bar blues Embodying The Light is a standout moment. The Coltrane tunes on the album are well chosen, being a mixture of classics and less well-known compositions. It’s good to hear Resolution from the classic A Love Supreme album and the ballad Naima given the Smith treatment. It’s even more interesting to hear the quartet get into music from Coltrane’s posthumously-released Transition LP, originally recorded in 1965. Dear Lord is a beautifully focused reflective performance from Smith, while Transition itself brings the CD to a rousing conclusion. The one standard, George Gershwin’s Summertime (recorded by Coltrane on My Favourite Things in 1961) is given a new introduction before being turned inside out with Smith taking two bites at this particular cherry, either side of Johnstone’s lolloping piano solo. In the end, this excellent CD is about Tommy Smith meeting John Coltrane for a thrilling extended workout. The album is launched at the Edinburgh Jazz Festival in July (gig already sold out), with further shows around the UK to come. BBC Scotland has already taken the wise precaution of filming this group performing some of the material – link below. LINK: Watch the Tommy Smith Quartet performing music from the album on BBC Jazz Nights At The Quay, May 2017.